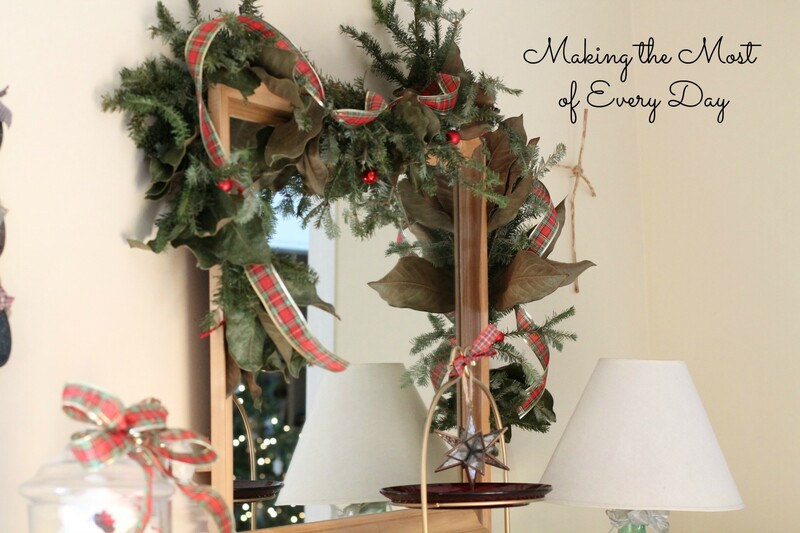 Today I’m participating in a Christmas Home Tour blog hop. Hello and welcome! 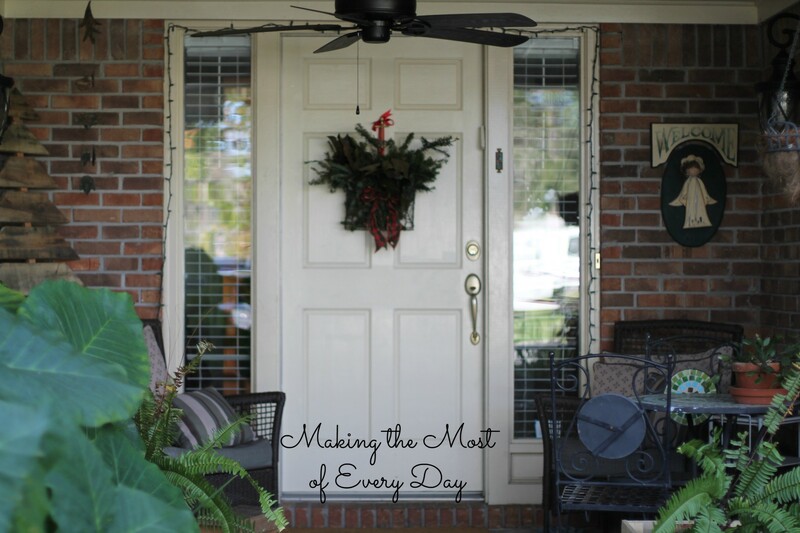 If you are visiting from Sarah’s blog, come on in! I’ll make you a cappuccino while you browse around. I hope you enjoy my home tour. Since I live in Florida, when you walk up to my front door you will be greeted by giant elephant ears. They will eventually die when we get a freeze but at this time of year we usually haven’t had one yet. 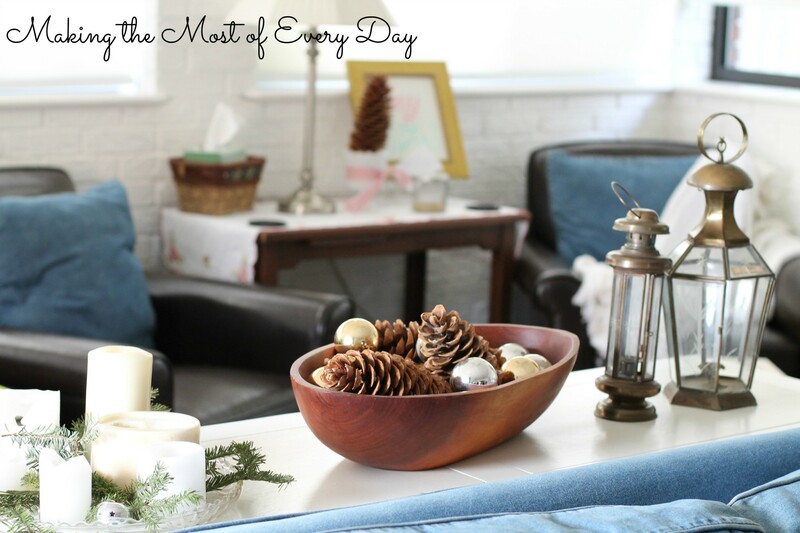 You’ll see a chicken wire basket of fresh greens on the front door in place of a wreath, a welcome sign that changes with the seasons, and a pallet Christmas tree. At night the lights around the door will bathe the area in a soft glow. When you enter the house, you’ll be in foyer. The little table holds a chicken wire tray with red and silver balls, a hand painted bowl with mints and a tiny nativity that we purchased in Israel in 2010. From the foyer, you’ll enter the living room. 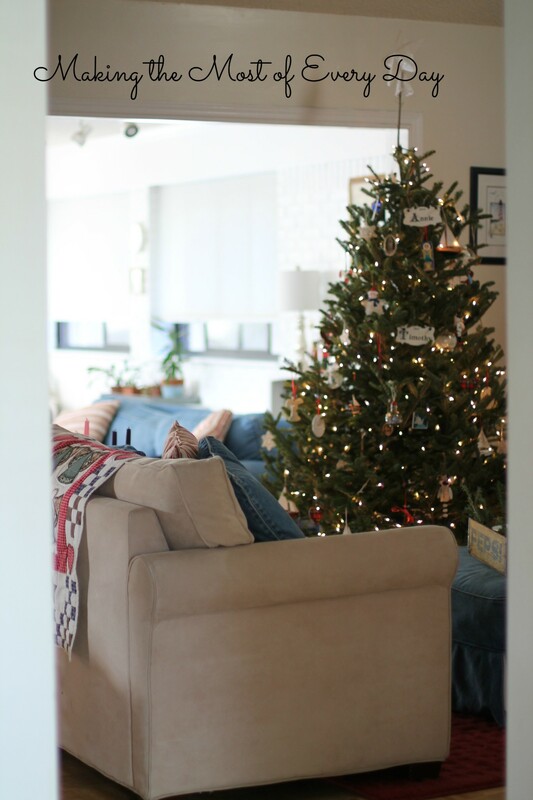 This small room with a fireplace is perfect for holding the Christmas tree. We only put about a quarter of the ornaments on this year, opting for simplicity. 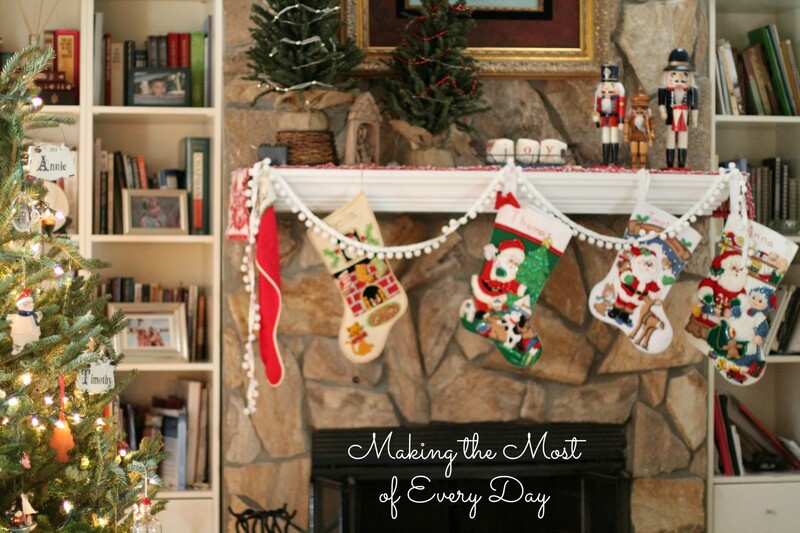 The mantel holds two small trees, three nutcrackers, another wooden nativity (carved in Africa) and a small tray with soft Pottery Barn blocks that spell out J-O-Y. The stockings were made by my mother except for Michael’s which is the one he grew up with. Mine is also my original one but my mom made that one too! 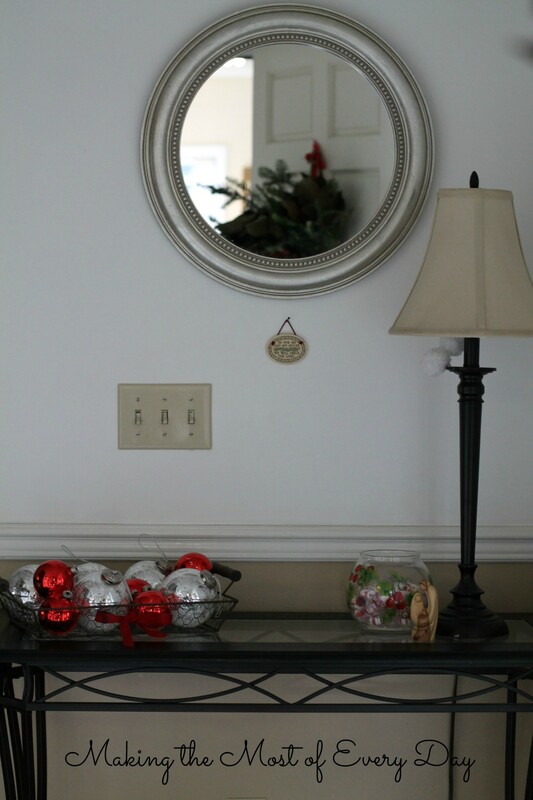 Pom-pom trim adds a fun little touch that looks like little snow balls. We love to sit by a warm fire when the temps dip in the 60s! The console table holds our large nativity set which we purchased years ago at a craft fair in Hickory, NC. 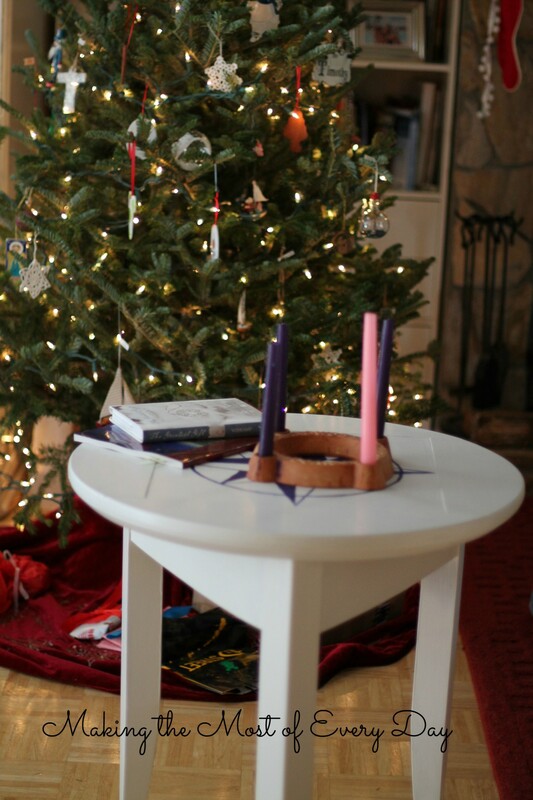 Next to the loveseat, the compass table holds our advent wreath and books that we’re reading this year. From the living room you pass into the family room. On the coffee table you’ll find more fresh greens in a white pitcher, red candles, and Christmas catalogs corralled in a tray. Penny was modeling for me. 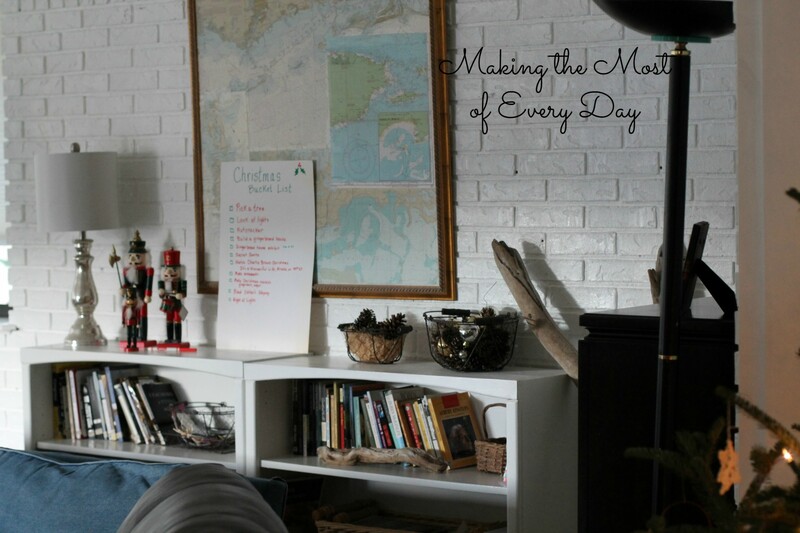 Behind the couch are two bookcases (cut down from one large one) which hold our school books as well as our Christmas Bucket List, three more nutcrackers and two more chicken wire baskets with pinecones and more balls. Behind the loveseat is a console table which holds Turkish lanterns that my dad brought home from Turkey on one of his trips, a wooden bowl from Haiti with giant Californian pine cones (which I carefully carried back in my carryon several years ago) and a crystal tray with white candles and greenery. In the background you can see the reading nook. From there you can go into the dining room/kitchen area. 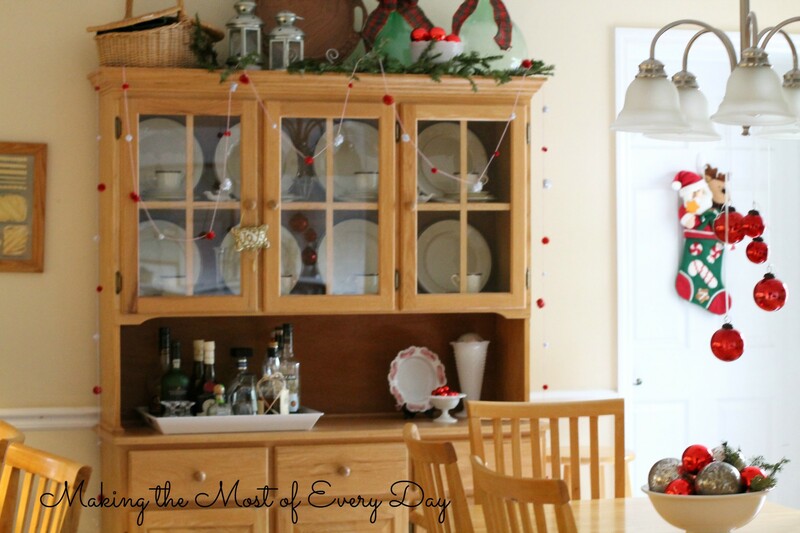 The china hutch is decorated with fresh greens, IKEA lanterns, green glass bottles made to hold olive oil (brought back from Italy years ago), a pom pom garland I made last year, and some of my milk glass collection dressed up with red ornaments and ribbon. The dining room table holds a footed bowl with silver mercury glass balls and red regular glass balls. Red mercury glass balls hang from the chandelier. The mercury glass balls were my splurge from the Ballard Designs class I attended. I hope you enjoyed the tour! Feel free to poke around the site a bit before you hop on over to the next house tour. Some popular posts have been the Tuesdays with Tina series, where I share my mother’s life, from being born in a bomb shelter in Italy during World War II to eventually meeting my American father. You can catch the latest one here but it links to all the other ones. Or you might enjoy my month-long 31 Days of Fashion – part of the Write 31 Days challenge – about all things fashion. You can find the home page for that series here. Thanks for visiting! 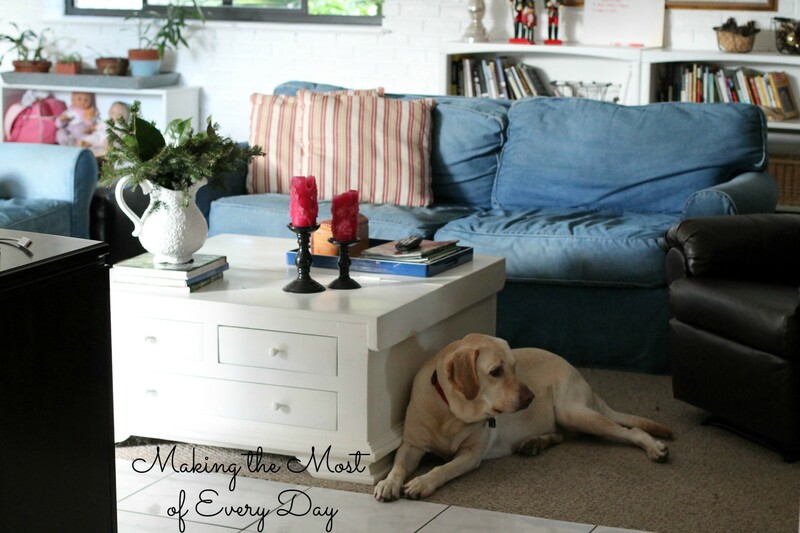 Now head on over to Christy’s blog to see her home! Merry Christmas! such a beautiful home. It looks so cozy, makes me want to chill with a big cup of coffee and listen to christmas carols! Thanks Shaunacey! It’s a simple homey home, not at all formal. We’ve been working on it the past few years and it’s coming along! Glad you stopped by! Your house is beautifully decorated – and I am sure all the fresh greens smell wonderful. Thanks Lisa! I love using fresh greens! Especially on the front door! Smells great! Beautifully cozy and inviting. I’m anxious to come by for a coffee! What does your week look like? Let’s do it! Your nativity scene is beautiful and so unique. Great decorations! Thanks Christy! We wanted something the kids could play with when they were younger. I love the simplicity of the wooden blocks. OH my gosh I love everything. So much to write about. But all of the fresh greenery is perfect, and the nativity scene, I love it! I forgot to take a picture of our advent wreath, darn. Oh well! 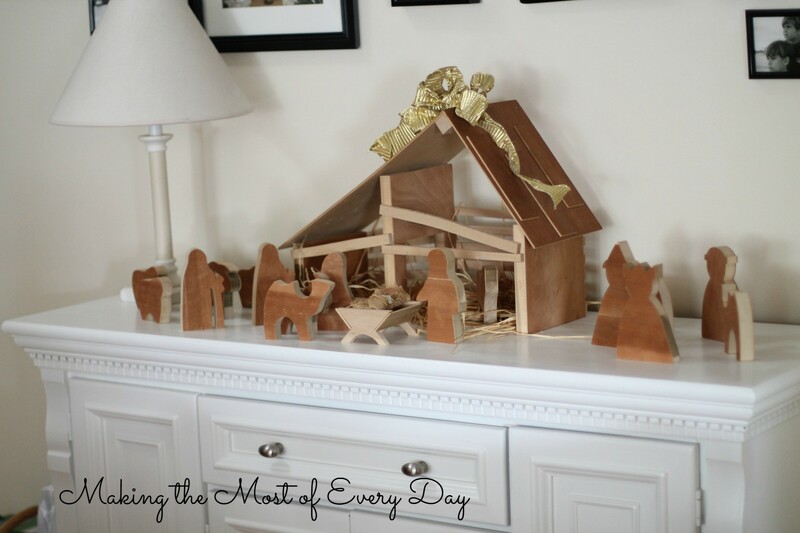 I have been looking for the perfect nativity scene, haven’t found it yet, but one day…And your pictures look fantastic, you did a great job capturing your home. You took some beautiful pictures of your home- great lighting! Your house feels so cozy and I love how so many pieces have stories. Your home is so beautiful! I love all the things you have from other countries, which make them extra special! Lovely! That nativity set is one of the nicest ones I’ve ever seen. So clean and simple, but beautiful. Cozy home! Thanks Nicole! I do like how simple it is and how kid friendly too! Thanks for stopping by! Love the fresh greens you set about in different places. Must smell amazing! The pallet Christmas tree is fabulous. Love the mercury glass, your chicken wire basket, the stockings and nutcrackers. Such a homey home. Mercury glass is my new thing ! I just love it! Thanks for stopping by Leslie! Beautiful home Sheila!! I love all your sweet touches!! And love the foyer table with the basket of ornaments!! And toyr nativity is great!! I have to an an advent wreath to my decor!! Merry Merry!! Thanks Katie! My advent wreath is about 18 years old! I love this tradition!